Can we hope that God might be willing to bless America? I think Isaiah chapter 58 does offer some hope. Connie and I got to work on this chapter together on our recent road trip. We had each spent 2 or 3 days on it separately, then we left on vacation and got to do the last couple of days together, which was very enjoyable and productive. I would read the passage aloud, with my notes and scribbles, while Connie was driving. She would make comments and observations, most of which I wrote down. It was particularly valuable because 1) it got us tracking together in one passage and one set of ideas, and 2) we each saw emphases and insights that enlarged the perceptions of the other. One big thing that stands out is God’s desire for good for these people. God’s desire is intense, and the goods are very great goods. Apparently the target audience here are those who HAVE the money, the power, and all the strong commitment to religious habits. They are the ones whose behavior God despises, and EVEN THEY are offered healing, restoration, and security. It seems to me not irrational to extend such hope even to us Americans. 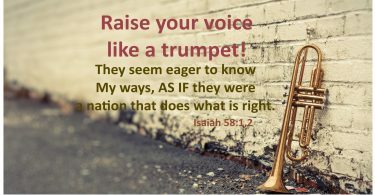 The intensity of the first verse “Shout it aloud, do not hold back – Declare to my people their rebellion” sounds pushy, judgmental, frightening, and it is. And it doesn’t get any “better” as you read the verses that follow about their false fasting, self-indulgence, oppressive behaviors, belligerence, and assumption of their own righteousness. BUT that first verse is there because of the great blessings freely available to these same people, and enumerated in the last half of the chapter. From where I sit, it looks to me like America could use a great deal more light and insight than we generally have. We could use some very profound healing of cultural patterns, dominant sources of entertainment, information, and thought, deep psychological and spiritual characteristics and habits. And here God through the prophet says those things are “quickly” available! Wow. God is not screaming rage and judgment at us for being in difficult situations – even if we helped cause those situations. God is promising quick healing and salvation if we will only switch to God’s moral / ethical /spiritual priorities. “Your people will … raise up the age-old foundations.” I love this. There are moral and spiritual (and even intellectual) foundations that are still there, still available to us – even though the structures once built upon them may have disappeared. WHAT A BLESSING to be among those who rebuild justly on these old foundations, who discern which of them are worth rebuilding and do so. These are not the kinds of blessings you can go buy at Wal-Mart, or order up on Ebay or some specialty source on the internet. You can’t even buy them like fixing an election. They are just simply unavailable unless God gets personally, directly involved. Quit the malicious (hateful) slander that so often accompanies abuse of power. Did you notice how the prophet links “the yoke of oppression” and “the pointing finger and malicious talk”? Have you noticed how often we justify not caring about those “less fortunate” because of all their bad habits, bad culture, or bad genetics which we can so quickly point out? Well, here the Lord is listing the bad habits of those who HAVE the money, the power, and all the strong commitment to religious habits (the US, and US Christianity? ), and He is offering healing, restoration and security even to them. And you know something? In seeking help from God, we don’t have to get EVERYthing all perfectly straightened out all at once in order to start receiving grace. God responds quickly when people repent, that is, when we seriously start moving in the right directions. This is a good chapter to go back to frequently.